X-kit Achieve! 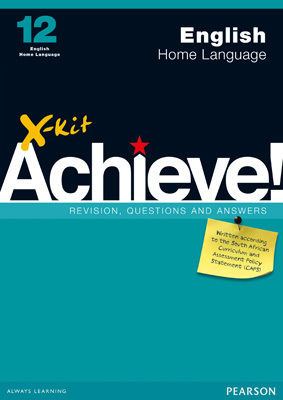 Grade 12 English Home Language Study Guide | X-Kit Achieve! Practice, practice, and more practice! Covering grammar, comprehension, visual literacy, literature and literary devices and transactional writing, X-kit Achieve! English Home Language Study Guides give learners plenty of opportunity to practise those skills they typically struggle with in English. Graded exercises allow learners to assess and improve their knowledge and skills. Language and literary concepts are explained in simple language in a comprehensive glossary with examples. Transactional writing formats comply with the latest CAPS standards.